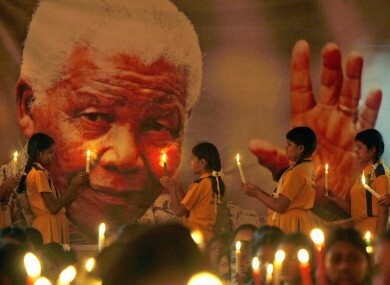 Schoolchildren hold candles near a giant portrait of former South African President Nelson Mandela in Chennai, India. THE SOUTH AFRICAN President Jacob Zuma has confirmed Nelson Mandela will be afforded a state funeral to take place Sunday week, 15 December. Mandela is to lie in state at the seat of government, the Union Buildings in Pretoria, between next Wednesday and Friday, he added. The political icon is to be laid to rest in his home village of Qunu in the Eastern Cape. South Africa has declared a period of mourning all next week, beginning on Sunday with a “national day of prayer and reflection”. Áras an Uachtarain has confirmed tonight that President Michael D Higgins will fly out for the State Memorial Service, to be be held in Johannesburg’s FNB Stadium on Tuesday. The White House also confirmed US President Barack Obama and First Lady Michelle will travel to South Africa in the coming days to pay their respects. Press Secretary Jay Carney said they would “participate in memorial events” for the iconic leader, who died yesterday at the age of 95. Political leaders, royalty and famous figures from the worlds of music, sports and entertainment are expected to travel to South Africa in the coming days ahead of what’s likely to be one of the most important funerals of recent decades. There was a steady stream of people turning out at the Mansion House in Dublin today, where Lord Mayor Oisín Quinn opened a book of condolence to mark Mandela’s passing. The book will be open again tomorrow and on Sunday, between 10am and 5pm. It will then be moved and opened at the South African Ambassador’s Residence at Shrewsbury Road, Ballsbridge. Saint Patrick’s Cathedral in Dublin will also open a book of condolence tomorrow. The Cathedral is open from 9am to 5pm Monday to Saturday and from 9am to 10.30am and 12.30pm to 2.30pm on Sunday. A book of condolence has also been opened at City Hall in Cork. In Limerick, books are open at County Hall in Dooradoyle and at City Hall on Merchant’s Quay. The news of Mandela’s death was featured on all the front pages around the world, while messages of tribute flooded in from international statesmen such as Obama, David Cameron, and President Michael D Higgins. From Beijing to Kiev to London, members of the public offered spontaneous celebrations of Mandela’s life to sit alongside official displays of mourning. A statue of Mandela outside the British parliament was the focus for one of the biggest tributes, while mourners left floral offerings at South African embassies around the globe in a sign of his far-reaching influence. People also left South Africa scarves, candles and portraits at the foot of the huge bronze statue. One woman taped a picture of Mandela to the stone plinth next to where his name is carved. Hundreds of people lined up to pay tributes at South Africa House, the country’s embassy in London, which sits on the corner of the famed Trafalgar Square. Many countries, such as Government Buildings in Dublin, ordered their flags to be flown at half mast, as did the European Union in Brussels. In Ukraine, where protesters angered by the government’s decision to reject a historic deal with the EU have taken over the main square in Kiev, one demonstrator hailed Mandela’s influence. “For Ukraine he is a symbol of democracy and equality between all nations and races. He was a major figure, we respect him,” said Viktor, 58. In the Chinese capital Beijing, people left huge wreaths of flowers outside the South African embassy. College students also left bunches of yellow flowers by a photo of Mandelaset up in Hengyang, central Hunan province. In Paris, an enormous portrait of Mandela was displayed on the facade of the Quai d’Orsay, the palatial 19th-century building that houses the French foreign ministry on the banks of the River Seine. Floral tributes were also left in front of South African embassies in Brussels and the Australian capital Canberra. Email “Higgins to attend Mandela service, as funeral plans confirmed”. Feedback on “Higgins to attend Mandela service, as funeral plans confirmed”.